Amy, thank you for all the effort you've done! You're a great team. We're very pleased to have a partner like you! You are a hard worker Andrew, because shouldn’t you be sleeping? Thank you so much for helping us with this case! Fuushan water tank designed and manufactured by BH Technology Co.,Ltd., are made of environmentally-friendly, nontoxic polymer material that contains in more than ten kinds of anti-aging, acid-resistant, alkaline-resistant and fire-resistant additives. They have been widely used for storing and transporting water and fuel. Besides, they are very user-friendly, and can be assembled within two minutes with connectors and pipes supplied. After use, they can be folded for future use. Mostly importantly, it is affordable and economical. 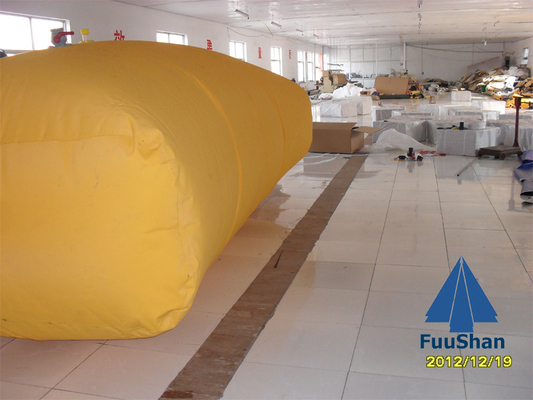 Fuushan manufactures a wide range of Large Water Bladders which are ideal for temporary and long term storage of various liquids. Including Rain Water, Grey Water, Chemicals, Diesel and Slurries to name a few. All bladders are made from 1100gsm fabrics or greater which are the thickest and strongest on the market place today. Various Fittings are available from standard irrigation tank outlets to custom PVC, Galvinised, Stainless Steel or Aluminium flanges in 2,3,4,and 6" diameter. Does not leach plastic taste into water.